Professional Wireless Communications is a full service repair depot and systems integrator. We provide localized repair service for all brands of two-way radios (portables and mobiles) and most other radio-related equipment, and also offer a 24-hour emergency repair service. We are a licensed, bonded and insured communications company who is authorized to perform on-site repairs at any facility. You’ll find our radio repair rates are often significantly less than the flat rate repairs from our competitors. At PWC, we understand that when your radios or system aren’t performing correctly and need repair, time is of the essence. 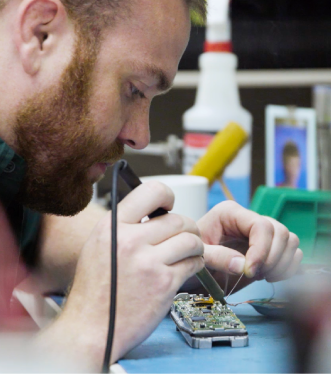 We maintain in-house repair and field service with FCC-licensed technicians, and stock a deep inventory of parts to ensure a quick turnaround or a replacement part. Try us out today and receive $75 off your first radio repair service! Fill out the form below to get started and redeem $75 off your first radio repair service with PWC (new customers only). A PWC representative will contact you within 1-2 business days.